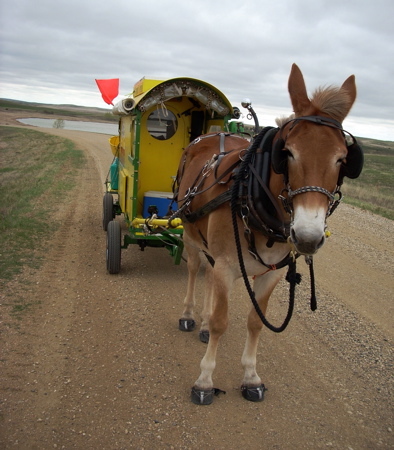 Traveling by mule wagon across the Great Plains, under what used to be a 1000-foot deep sea, it’s hard to imagine what the vanished marine inhabitants looked like. Still, given what I have on hand, one mule and some photos of a mosasaur skull, I’ll try. 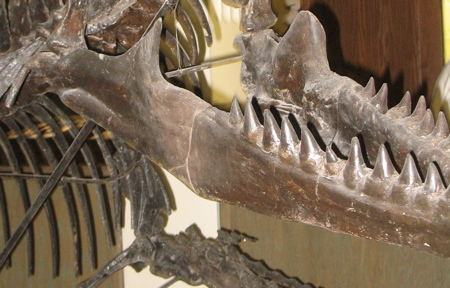 Today, we’ll look at the mosasaur’s head, in particuler, the structure of its mouth. To review, the mosasaur was a marine lizard that swam in the Lost Sea 80 million years ago. Its closest living relatives are snakes and the monitor lizard. Today, we’ll talk about its jaws and mouth. Polly, who just happens to be standing idly by, will be pressed into service. Here’s what Polly’s front teeth, her incisors, look like. A typical herbivore, she sports 12 incisors in the front of her mouth – 6 upper and 6 lower. These flat teeth are designed for tearing grass (and the occasional book-signing cookie). Okay, now let’s look deeper into Polly’s mouth. For this, I’ll cram my camera into those teeth for a photo. 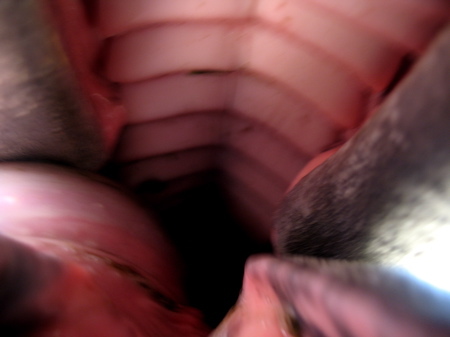 Here’s what the inside of Polly’s mouth looks like. What’s striking is how the roof of Polly’s mouth is corrugated. See those triangular, ridge-shaped rows of tissue in the roof of Polly’s mouth? As Polly chews grass, she presses the bits of food against these ridges with her tongue. 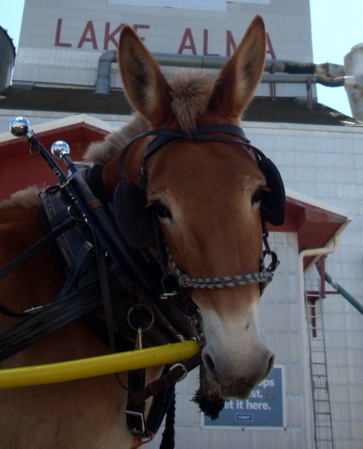 They’re sort of like one-way speed bumps, allowing bits of food to pass toward her throat – but not back out. But what does this have to do with a mosasaur’s mouth? Quite a lot, actually. 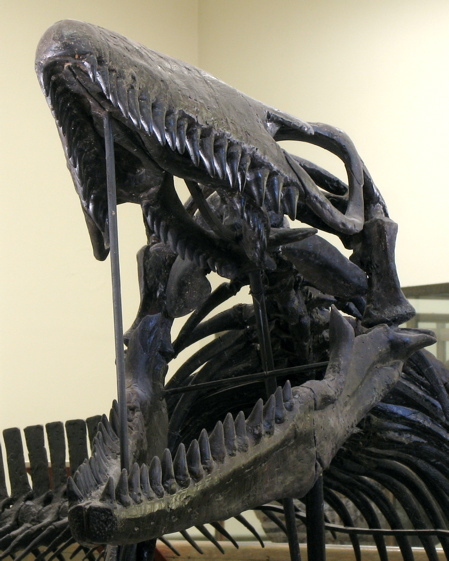 Like Polly, the mosasaur’s mouth was designed to grab stuff, then work it down its throat. Here’s a photo of a mosasaur fossil’s maw. 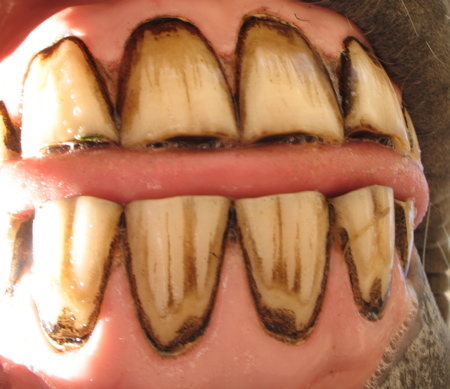 Most notable are the shape of the teeth. Slender and conical, they were designed for grabbing and holding, not shredding, prey. Okay, so a mosasuar has clamped down on a 4-foot fish. What next? That’s where the pterygoids come in. 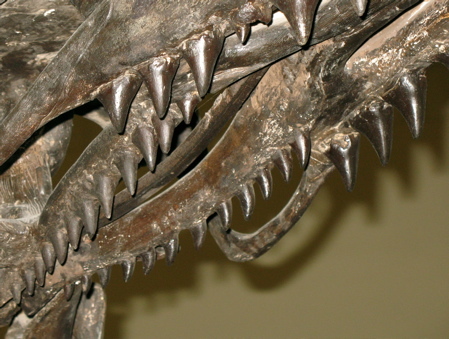 Ptergygoids are special teeth found in the roof of the mosasaur’s mouth, way in the back. Like the ridges in the roof of Polly’s mouth, they helped hold food in place in it’s inevitable journey toward the gullet. 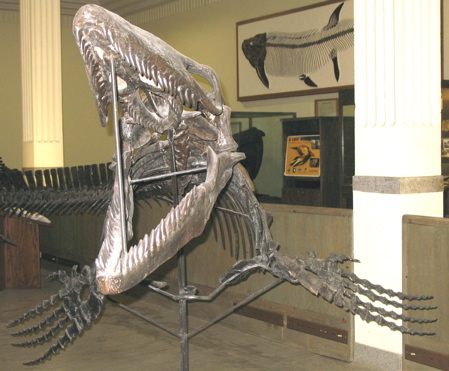 Something the mosasuar had that Polly’s doesn’t is a double-jointed jaw. If you look closely at this next photo, you’ll see a second joint in the jaw. It appears as a fine tan line in the lower jawbone, right behind the last teeth. This, along with a floating lower-jaw joint, allowed the jaw to swing open to almost 180 degrees. This allowed it to ratchet over-sized prey down its throat like a modern snake. So that’s the last things fish and grass blades see here on the Lost Sea. Coming next, how you can get your hands on a piece of Lost Sea mosasaur lore.